One fascinating aspect of working at a native plant nursery is that you have the opportunity of seeing native species in a variety of different stages of development. For example, we seeded these white oak (Quercus alba) last fall immediately after the acorns were collected. This individual is representative of the average height at this time of year. These saplings were seeded 18 months ago and are coming on strong. 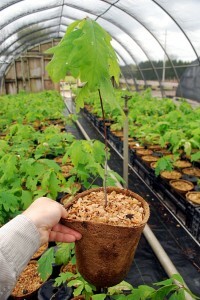 That shows you how much growth oak seedlings can put on in a year if they are taken care of well. 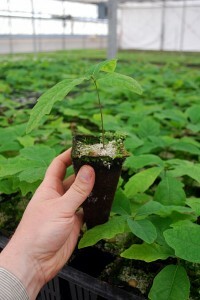 In another year, the seedlings that we started last fall will be the same height as these young trees. In two hundred years, they could be as large as this tree in Oakville, ON. It’s a blessing and a privilege to be starting something that has the potential to have that kind of legacy! New production facility now in full swing. Setting up 2015 Research Trials! Thinking of warmer days ahead … we’re very excited to join this premiere event!